The WMEA1005 series of AC DC wall mount power supplies provides 6 watts of output power in a compact package. This series consists of single output models that have an input range of 100 to 240VAC and output voltages ranging from 5V to 12V. 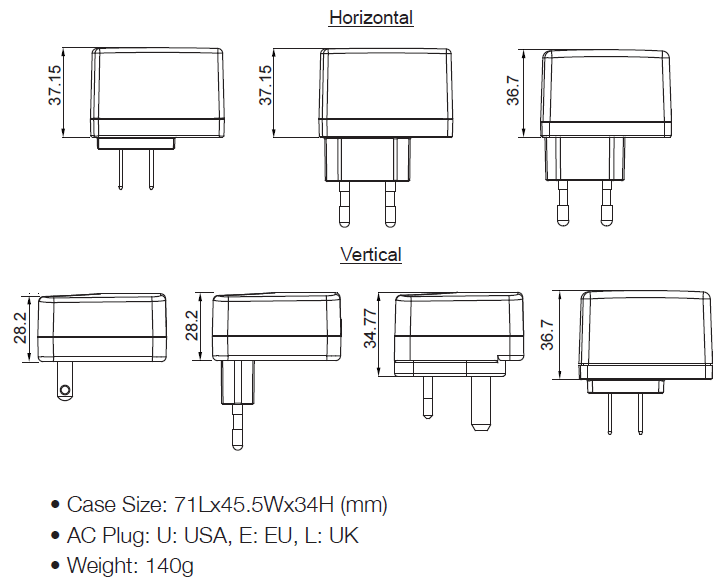 Several different options are available for this series; AC plug type can either be USA, EU, or a UK plug, case type can either be horizontal or vertical, and output type can either be USB or SR type. This series is both RoHS and Level VI compliant, and has UL/cUL, UL60950, UL60065, CB, CE, and FCC Safety Approvals. Please call factory for order details. Dimensions: Vertical US and EU Models: 2.8" x 1.79" x 1.11"
Vertical UK Models: 2.8" x 1.79" x 1.37"
Horizontal US and EU Models: 2.8" x 1.79" x 1.46"
Notes: (1) “x” in model number indicates the AC Plug type. “x” can either be “U” for US Plug, “E” for EU Plug, or “K” for UK Plug. (2) Ripple & Noise is measured by using 20MHz bandwidth limited oscilloscope and terminated each output with a 0.1µF ceramic capacitor & parallel with 47µF aluminum capacitor at dull load and nominal line. (4) Certificates listed are for reference only. Please call factory for details.